Contestants and judges from the Digilent Design Contest finals. 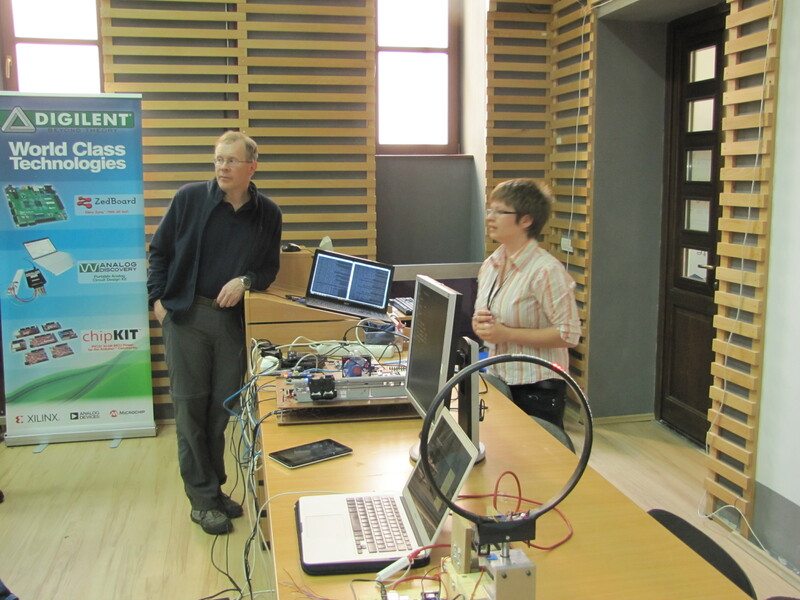 On the first day, after the opening session held by Mircea Dabacan (managing director of Digilent Romania), the proceedings took place in three separate rooms. Mircea Dabacan opening session speech. 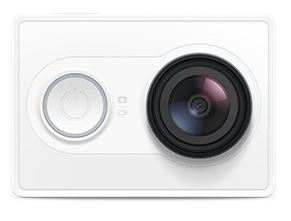 This year, a lot of projects covered everyday life areas like environmental protection, home automation, health and security, and entertainment. The top four projects in each room were selected to be in the finals on May 17. In the afternoon, we held a round table where we invited advisers and students to have open discussions about using and improving Digilent products. 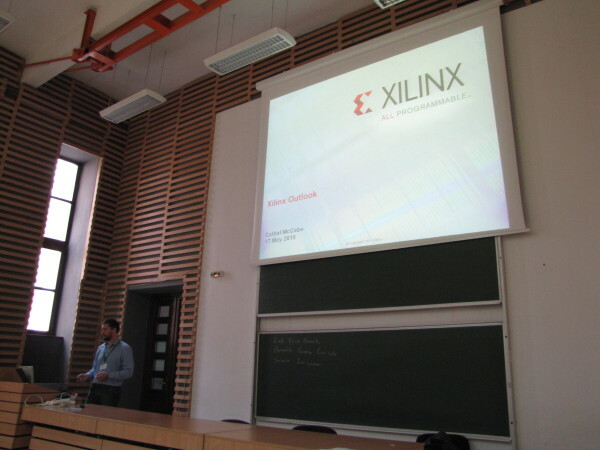 Gabriel McCabe from Xilinx shared latest information about software and hardware solutions. Gabriel McCabe from Xilinx EMEA speaking at the round table. On May 17, the winning teams selected the previous day to compete in the final round again defended their projects again in a single room. Health and Security Cloud System – Eusebiu Burlacu and Sebastian Pascu from Gheorghe Asachi University Iasi, Romania, designed a chipKIT WF32-based project able to take ECG signal from the body, process the signal, and send samples in the cloud. It also monitors the patient activity and make available all information to the doctor via cloud system. First prize– the Health and Security Cloud System. 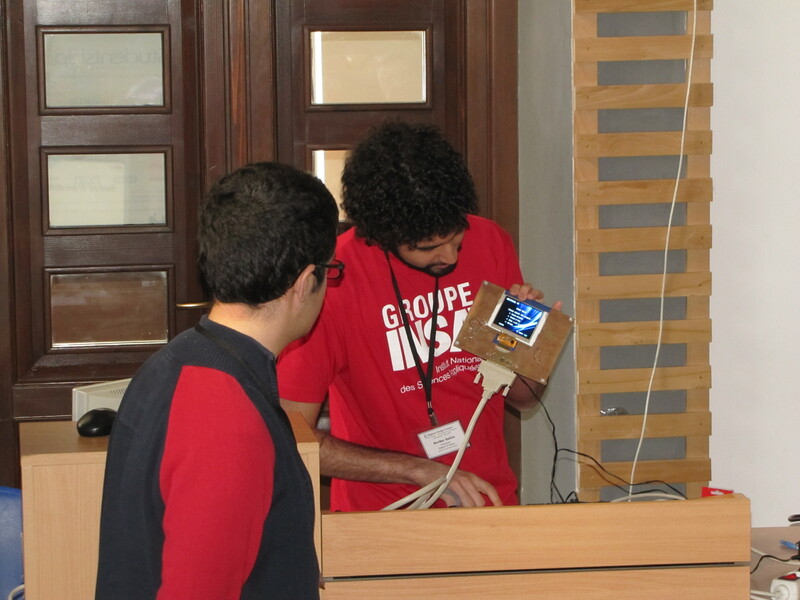 Portable Game Console – Guillaume Fauxpoint, Oussama El Fatayri, Serdar Sahin, and Hugo Bevilacqua from INSA Toulouse, France, created a project based on the Nexys 3 board to match the performance of a 16-bit gaming platform with multi-layer frames and scrolling. The other first place winner — the Portable Game Console. 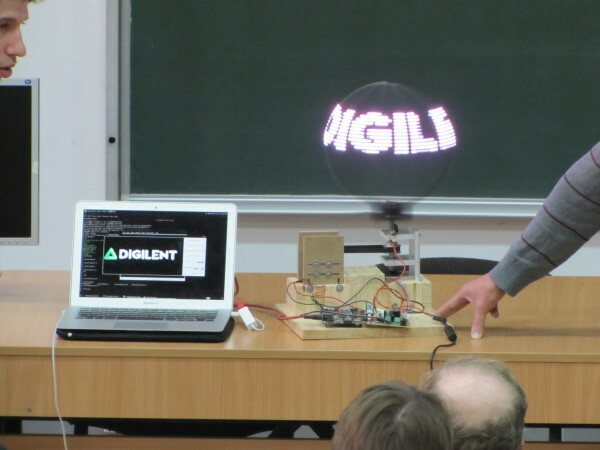 RFID Travel Automation Gadget – Andrei Vlad Verdes and George-Radivoi Rosu from Polytechnics of Timisoara, Romania, built a small-scale prototype vehicle that follows a desired path using new radio-frequency identification technology with the aid of the Basys3 FPGA’s fast response time. The second prize, the RFID Travel Automation Gadget. The Globe of Persistence – Antonin Martin-Schouler and Nicolas Duminy from Telecom Bretagne, France found a new way of using the concept of the persistence of vision to create an impression of fluidity of movement and the illusion of a 3D object. The other second prize, The Globe of Persistence of Vision. 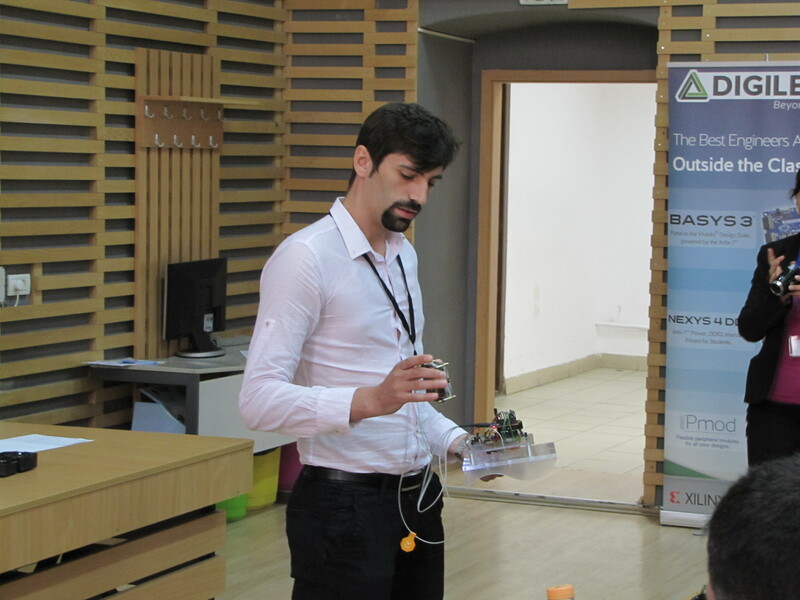 The third prize and Xilinx University Program special prize went to FPI Droid House by Oana Valentina Rusu from Petru Maior University in Targu Mures, Romania – it is a monitoring and control platform based on the Nexys 3. It provides the possibility of controlling multiple houses from one single web interface and the possibility of using existing devices with minor changes. Third/XUP Prize: FPI Droid House. 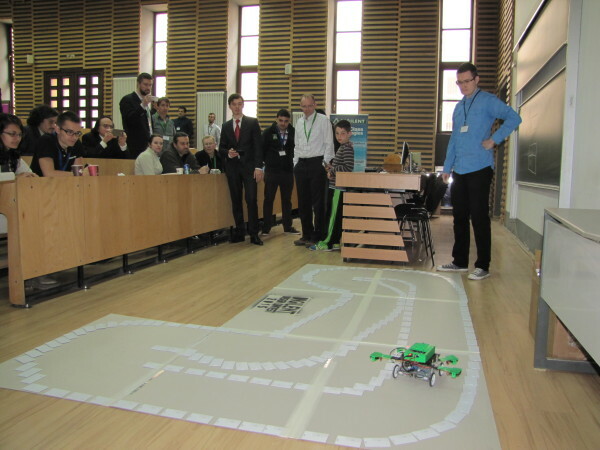 The most dedicated advisers who had a constant presence advising the teams through the duration of the contest were awarded “Best Adviser“: Stefan Oniga from North University Baia Mare and Cristian Gyozo-Haba from Gheorghe Asachi University Iasi. Clint Cole and Mircea Dabacan were invited to a TV station to show the audience the innovative projects that were born from the DigilentDesign Contest. 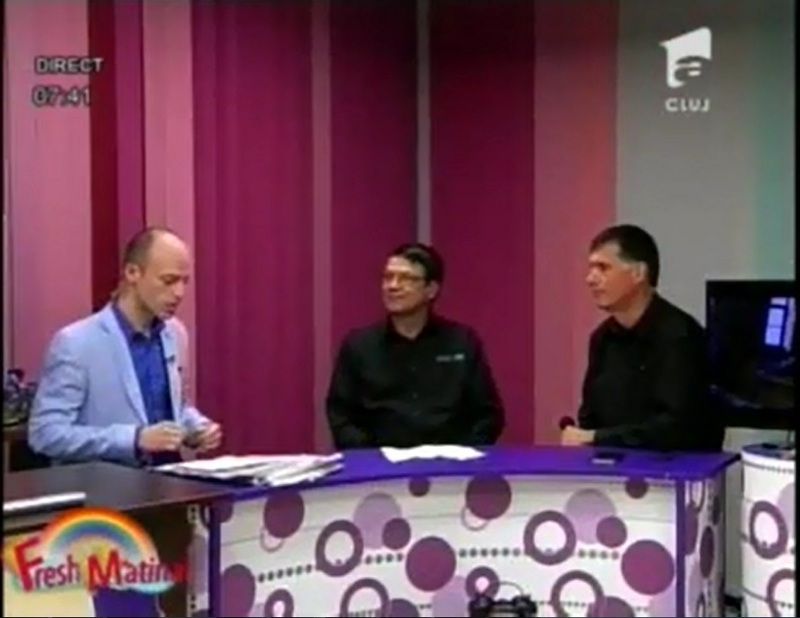 Clint Cole and Mircea Dabacan interviewed at a local TV station. 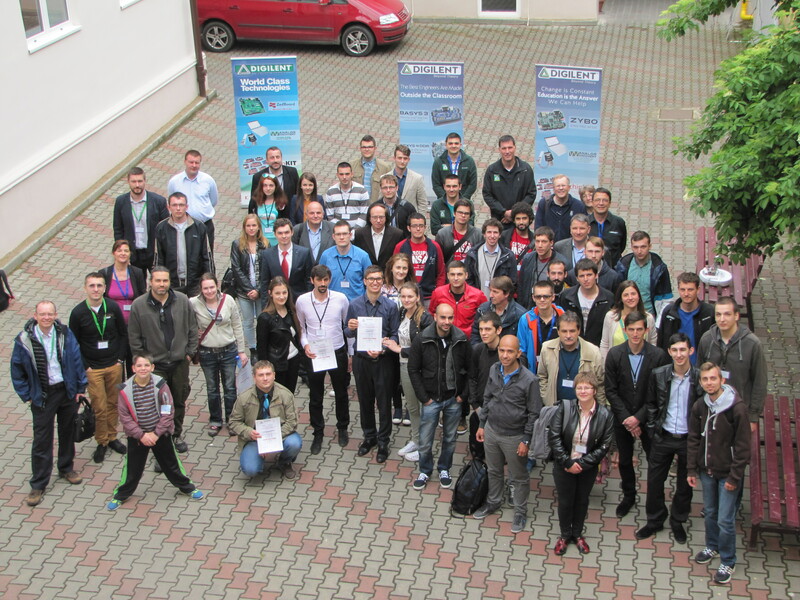 All in all, the contest was a great experience for students, advisers, and Digilent Romania team as organizers. It not only showed technical skills, but also interpersonal relationships and communication, both of which are important for a successful future. 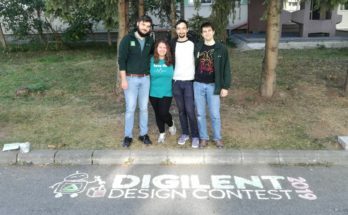 Soon we will post more photos on the Digilent Design Contest site. 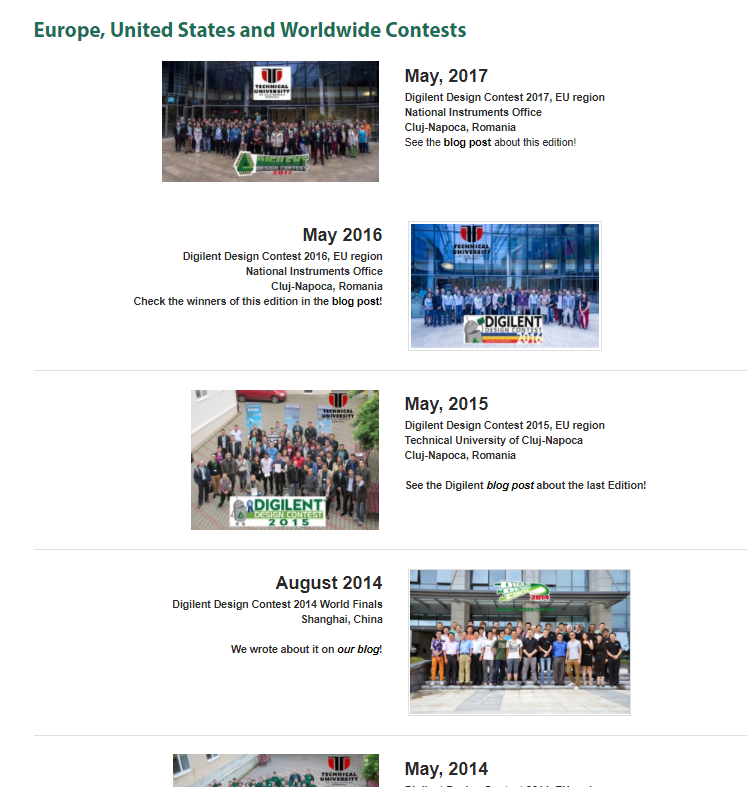 Stay tuned to find out more details about the next edition of the Digilent Contest!